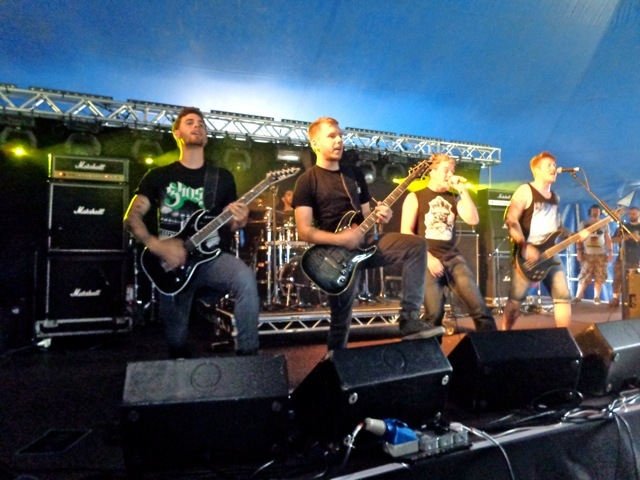 There’s definitely a New Age of British Heavy Metal percolating, and there was no better place than Sonisphere UK to showcase and put a thumb on the pulse of it. Still, while there were many young bands sharpening their teeth over the course of the festival, among the ones I most wanted to catch was THE RAVEN AGE, the Essex-based band with an impeccable pedigree in that it features founder-guitarist-songwriter George Harris, the son of IRON MAIDEN’s Steve Harris. But that wasn’t the only reason. An advance listen to some of the band’s work revealed a heavy and epic melodicism – combined with explosive power – that was not dissimilar with that of the classic NWBHM sound of lore. 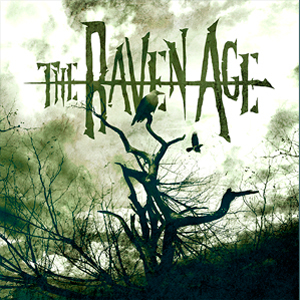 THE RAVEN AGE, all in their early 20s, exemplify – despite gloomy essays to the contrary – that rock, including dramatic heavy rock, is alive and well in the world with the next generation ready, willing, and able to carry on as torch-bearers. 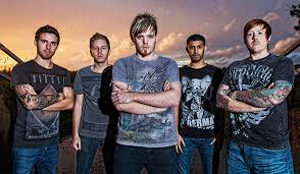 Indeed, while it is true that the phrase “next generation” is quite literal with this band, and it is also true that that can be a blessing or a curse (considering the potential albatross of having to measure up), it only takes a listen to the explosive live set to make clear that the prognosis is highly promising in light of THE RAVEN AGE’s infectious, hooky songwriting, epic themes, majestic melodies and production - in hand with the unbridled enthusiasm and swagger of a born winner. GEORGE: Well, the band got together when me and Dan [Wright] got together coming on to five years ago, I think. We just got together and started to throw some ideas back and forth. KNAC.COM: Did you live near each other? GEORGE: We were from the same town, about 10 minutes down the road, so we started just jamming together, basically. KNAC.COM: But you weren’t school friends, or anything like that? DAN: Yeah, We met through them, basically – well, actually she’s my fiancé now because we’re getting married next year - and we were actually invited to a wedding, but only in the evening, so we were forced to spend the day together. (laughs) And then we discovered that we liked the same music and that we both play guitar. KNAC.COM: That’s very natural, and that’s the way that most things do “happen,” I think. GEORGE: Yeah, exactly, and we just tried to play some riffs back and forth, and it was just a fun start, then we started to get more excited about it when it started sounding really good! KNAC.COM: Now, George, I know that you’ve had a musical background growing up in your family, of course, but what about you, Dan? DAN: I started playing guitar when I was about 13, and I just started playing songs, and trying to copy the riffs, and it wasn’t until I met George that I started to properly sit down and write songs. KNAC.COM: Did you feel intimidated trying to write songs at that point, especially you, George, due to high expectations? GEORGE: No, not really. I don’t know, the stuff we were coming up with, we were quite happy with the way it was going, so we thought, it’s time to sort a band out now. KNAC.COM: You figured it was time to take it to the next level? 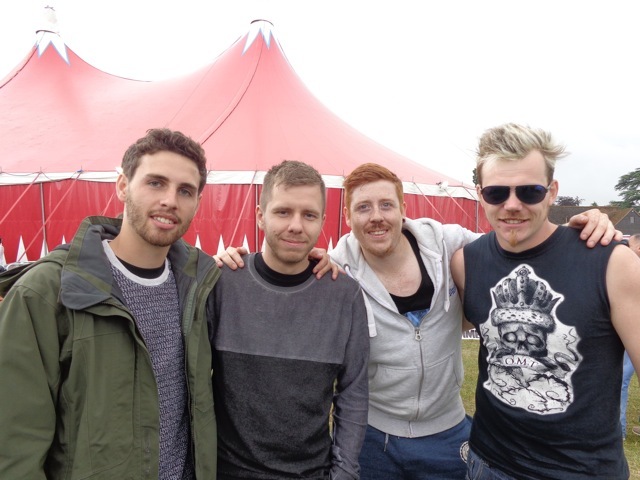 MATT: I actually found an advert on “Join My Band” – so I thought I’d apply for it, and then, yeah, they got back to me. So, I went down and had an audition a couple of weeks later. KNAC.COM: Did you live far from them? KNAC.COM: So, were you guys looking for someone who played a certain kind of music? GEORGE: Yes, definitely, and he’s into exactly the same music as we were, so it was perfect, really, he came down and learned the songs well. KNAC.COM: What kind of music did you say you wanted to make? I’m wondering what kind of music you call it yourselves. GEORGE: We just call ourselves a modern, melodic metal band, basically. It’s heavy, but it’s got a melodic vocal, that’s the main thing; there’s no screaming. KNAC.COM: So Matt, you got involved then – that was when? MATT: That was 2012 that I joined in, about two and a half years ago. KNAC.COM: Were you doing the singing before then, George? MICHAEL: I had recorded a demo with a friend of mine that’s in the other band, sort of a producer and the other singer – he’s a scream vocalist – so I sent that out to these guys, and they seemed to like it And they had already kind of head-hunted me. KNAC.COM: Nice to be wanted, right? MICHAEL: Actually, I think I played one song with you, and [to the guys], and you said they’d you’d already decided that if “you can do live what you did on the demo, then you’re in,” so it just went from there. GEORGE: He was wanted to the point where we were actually pushing hard on his girlfriend to get ahold of him so that we could talk to him! KNAC.COM: Not that it is something to dwell on, but had you previously been doing a similar type of music? MICHAEL: Well, SOUL SANCTUARY, there were six of us in the band, and my best mate is sort of a scream vocalist, I did a very small amount of scream myself. But, it was not really similar; it was more SYNDICATE-like. Basically he does scream, and I do mellow. But they’d heard one of the particularly mellow tracks we did, which we did for Sunami relief, and basically there was no scream on it, and they heard me singing that. I only found out recently that it was that track. And things went from there. … When I found out they’d been messaging me, it only took a week or two until it ran into rehearsals – only a week or two …. Then we were rehearsing, the four of us, for quite a while, playing tracks with a programmed drum, because we didn’t have a drummer. So, we were just doing that to get ourselves tight, and then Dan found Jai, our drummer, on a couple of tracks online. 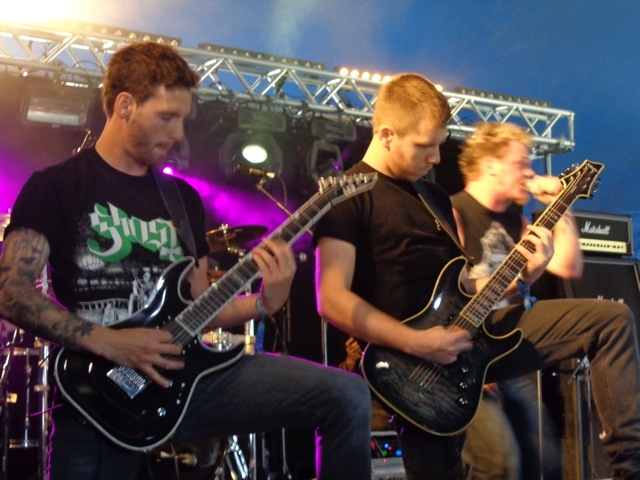 They were technically quite hard, drum-wise, so we went: check! If anyone can play that, they can probably play our level. MATT: We didn’t think we’d get him, to begin with. GEORGE: We thought there’s no way we’re gettin’ this guy! MATT: We just private messaged him on You Tube, just thinking maybe he would do us a favor and do some recording, because we could see that he was already in a band. DAN: Obviously he’d be here, but he had to go to a funeral today. KNAC.COM: And how does the songwriting work with this band? MICHAEL: When I turned up, there was already a massive foundation down; it was already written by George and Dan. MATT: Yeah, by the time I showed up, most of the album material was already written, wasn’t it? GEORGE: Yeah, we already had a lot of material. We’d already had a few good years together just getting ideas down, and the songs were already written. KNAC.COM: So now you have been cherry-picking them? GEORGE: Yes, we’d written songs before, but they weren’t quite as good as our new ones. So, we have our EP and we have an album ready. KNAC.COM: It had a long time to cook! KNAC.COM: And how many songs are on the EP? And what are the songs about? GEORGE: Four tracks … They’re about all sorts of stuff, really. MICHAEL: They’re deep and brooding, right George? GEORGE: The one you heard online, “Eye Among The Blind”, for instance, there’s a bit of a religious vibe about it, more of an anti-religious thing. We’re not real anti-religious guys, but it is just such an interesting subject. KNAC.COM: Well, it is a common topic amongst young people of a certain age, the whole range of topics surrounding organized religion. GEORGE: Yes, it’s an interesting concept: what it does to people and stuff like that. MICHAEL: Most of the songs are a story, and there’s a song, “Winds Of Change”, and it is about moving on, and leaving your home. KNAC.COM: And what are some of the other songs about? GEORGE: Well, “The Death March” on the EP is from a book I read called The Man Who Broke Into Auschwitz - and that was really interesting, and it was a true story. It was about his relationship with a man he met in camp, and what they got up to – and several things happened. KNAC.COM: And the last one on the EP? MATT: Well, “Angel In Disgrace” is a similar sort of concept there. GEORGE: It’s a religious thing again, and it’s kind of about spending your whole life being religious and faithful, then, when he goes up to Heaven, he’s getting denied. It’s a made up story. And all our lyrics are in the EP booklet, so you can actually read them and check them out for yourself. GEORGE: Exactly, and that is similar to what the last track on our EP is about, and it’s the one we close our set with as well, actually. KNAC.COM: So what’s the next logical step for you guys? GEORGE: Well, this was really exciting for us – Sonisphere – and the release on the same day! It was a big step for us, because we’d just been gigging, basically. But, we’re actually going on a two week European tour … And there’re a couple of other tour opportunities coming our way, but we’re not saying anything yet. Another next step is the next release; we’ve already got 95 percent of the album actually written already, and it’s now about getting into the studio and getting that recorded, so that’s going to be really exciting!